When good friends Izzy, Bevan and Brad arranged a trip to Welcome Flat to celebrate Izzy's birthday I cheekily suggested that if the weather permitted I might duck up to Welcome Pass for a look at Mt Sefton's West Ridge. A couple of months later and the week of the trip came around, coincident with one of the best spells of weather in the Alps in memory. After the short walk up the valley and a glorious evening in the hotpools I bade farewell to the team and headed up the Bluewater Route (a rough track in the bush as an alternative to the now largely impassable Scott Creek route of old) to the Tekano Neve and Welcome Pass. Finding the recently cut Bluewater Route in excellent condition I was able to make good time, despite soft snow and whiteout conditions at times (fortunately chamois tracks pointed me in the right direction from Pt 1800). I made Welcome Pass in 8h from Welcome Flat and settled in to a warm evening in the bivvy bag. After leaving my biv at Welcome Pass at 4.30 am a quick jaunt along the upper Douglas Neve led to a broad crevasse-free slope up to Pt 2602. From here the West Ridge of Mt Sefton meanders at the 2600-2800m mark until a final 35˚ slope leads to the summit of Sefton. After taking in the view I retraced steps on firm morning snow and was back at the biv before 9.00. Only four hours later I was down from the Pass to Welcome Flat at Scott Creek and 45 minutes later back in the hot pools - 9 1/4 hours from Welcome Pass to Welcome Flat via Mt Sefton! I rejoined the team who'd been up to Douglas Rock and we enjoyed an indolent evening in the pools before wandering downvalley to conclude an excellent trip. 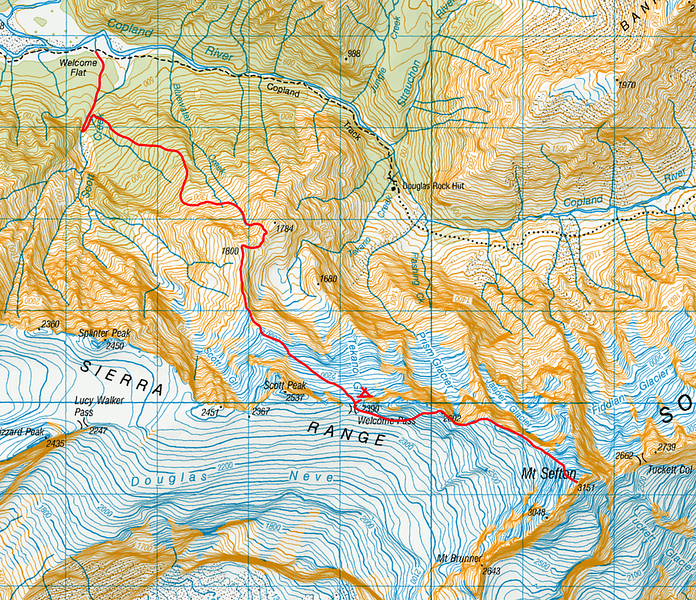 Bluewater Route and Sefton topo. The route is described at http://climbnz.org.nz/nz/si/main-divide-of-the-southern-alps/mt-sefton/bluewater-route-to-welcome-pass and is a well marked, pretty well cut track up through the bush from a large cairn on a terrace at the 600m contour in Scott Creek. From the bush line the track is cut but less well marked as it gains an obvious spur which is followed to around the 1260m mark. Minimal water is available except at the 800m contour and once in the basin below Pts 1800 and 1784. A good bivvy ledge for two people with some water in a muddy/mossy tarn exists at around the 1220m contour on the cut route. If anyone heads up there take flagging tape for the scrub please - this route is a great asset!